What's the purpose of each and how to get the most ouf of using each. Notifications that are persistent and require your personal attention. How do these 2 mechanisms work? Activity Indicators are meant to show something happen somewhere else (not on the page you are currently displaying). As these indicators are not meant to be managed nor acknowledged like a notification, they go away according to your navigation like badges on a mobile. 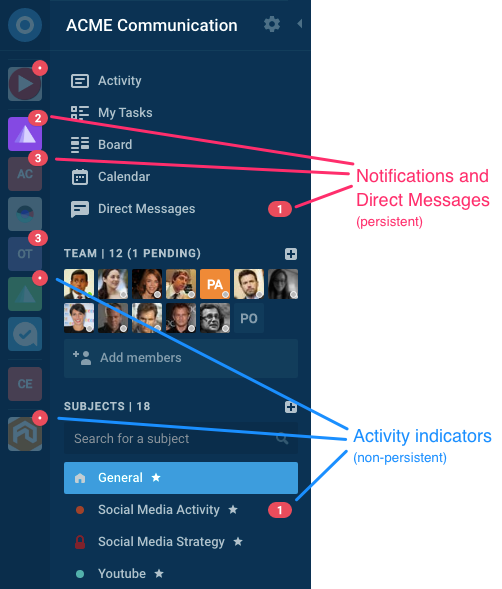 Activity Indicators include different types of events: Notifications and Direct Messages (that require to be marked as read), as well as simple badges (red points that go away as they get displayed according to user navigation). In other words, basic activities will go off as they get displayed, while Notifications and Direct Messages remain displayed until marked as read. Badges show a “red point” when there are only simple activities, and if there are any notifications for you, the red point is replaced by a number which tells you how many notifications are waiting for your action. By changing the setting Notify me on conversation, a new conversation or a new comment can be considered either as a notification or an activity indicators. More on this at the end of this article. If you are on the main Activity page it will go to the main Activity page of the next workspace you select and remove activity indicators accordingly. If you are on My Tasks or a Subject’s Tasks tab it will go to My Tasks (to remain on tasks). Please note navigating this way will preserve individual activity indicators for subjects that are displayed at the left. (*) Starred subjects, default list of alphabetically ordered joined subjects and open subjects can get an activity indicator badge. Subjects that are not listed on the left will not show an activity indicator. Notifications are persistent objects that appear under the bell icon - plus, depending on your personal settings, notifications can be pushed by instant individual email, as a digest email, and/or as a mobile push notification on the locked screen until you explicitly mark them as read. You can also mark notifications as unread to get back on them later. and even for every new message on a subject you are a members of. 1/ use @mentions as much as required to trigger persistent notifications, if you really want to not remove activity indicators when you navigate, being on a Tasks page will not cause the subjects badges to go away. display an activity indicator (non-persistent).